As the building’s audio-visual coordinator, Ruby and his mostly student staff are charged with keeping one of UW-Madison’s most technically rich meeting and presentation environments working to its full potential. Most of Discovery is wired for projection, multimedia, sound and live-streaming; it also includes the sophisticated Cisco Telepresence Room that can video-connect meeting participants across the world. Orchestrating this ensemble of audio-visual technologies to enable effective exchange of problems and ideas through images and conversations is a crucial element of the mission of the Discovery Building, says Miron Livny, CTO for the building and its research institutes. “AV is critical to scientific collaboration, to allow teams to work together, which is what the Discovery building is all about,” he says. Ruby spoke this month with Morgridge communications specialist Courtni Kopietz about his work at Discovery and the dozens of students he has trained over the past five years. What does a typical day at the Discovery Building look like for you? It starts with running through the Town Center and the rest of the Discovery Building checking media wall displays, information kiosks and digital signage displays; reading closing reports and emails; verifying setups and checking events paperwork; and, lastly, getting a delicious cappuccino from Aldo’s Café to start the morning. After that, it’s all about supporting the Town Center events and their various needs from internet connectivity to long distance collaboration via the Cisco TelePresence Room. How does your work impact the multiple entities in the Discovery Building? We like to think that there is a sense of confidence in having a technology-dependent event here at the Discovery building. Guests need not worry, because we take care of all the technological details so they can focus on their work, research, mission, and social networking. How did you gain the skills needed to be successful in this work? The simple answer is that life taught me the skills, and I spent a lot of time breaking and fixing things. I always had a passion and interest in electronics and audio/video engineering and was surrounded by it in my childhood. Growing up, my father had his own business repairing televisions, cameras, VCR’s, Betamax players, and he built his own studio for producing highlight videos for the high school football team. My mother was a theatrical producer and writer. Early on I started producing music with a homemade recording studio and a collection of musical instruments. I eventually went on to the Madison Media Institute for a program in Recording Technology/Audio Engineering and upon graduation started working at the Fluno Center in Madison. At the Fluno Center I learned how a professional conference center operated and gained skills from my manager– a world-class teacher– in audio/video, and programming computer and networking concepts. I also learned the power of using software applications to build processes, something that is incorporated into the work my team and I do at the Discovery Building today. 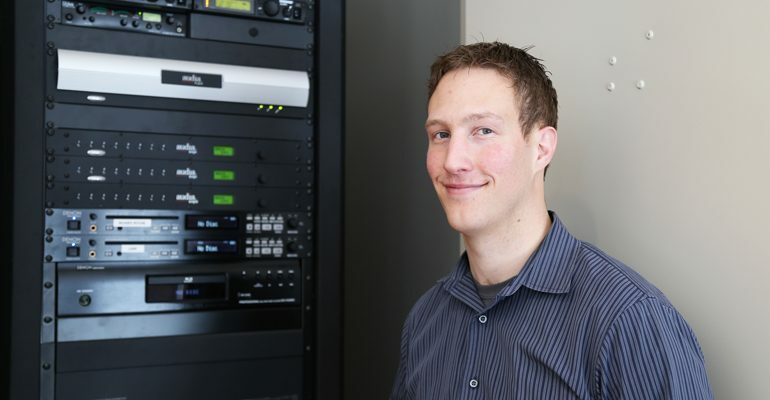 I came to the Discovery Building by way of AVI Systems, a job that took me all around the state of Wisconsin installing video projectors, audio speakers, video displays, running audio/video cables through walls and ceilings, and soldering video and audio connections. One of the major jobs we worked on was the Wisconsin Institutes for Discovery, the space now referred to as the Discovery Building. I fell in love with the building, found they were hiring, and the rest is history. What do you hope the students you work with take away from their experience with you? To share skills and knowledge with the A/V technical interns, we take the complex technology and facility we have here and break it down into fundamental concepts. We often challenge the interns to find the best solution to a problem, so that they are able to troubleshoot and diagnose a problem independently. We hope that the A/V technical interns leave with a great reference for future opportunities in their career, and that they have an outstanding experience to print on their resume. Working with students, we like to think that the environment found at the Discovery Building is stimulating, yet extremely flexible, allowing their academic pursuits to be top priority while still building experience at the workplace. Over my five years of working here, I have seen great post-graduate success from our interns, with them becoming anything from software engineers and physics teachers to management positions at technology companies. The most challenging part of the job is facing the unknown and understanding that every day we combat Murphy’s Law– what can go wrong, will go wrong. We put in extensive effort to set fail-safes and proactive approaches to our technology, setups and equipment testing. Major VIP events can also be challenging. They often consist of many months of planning, several meetings, massive amounts of emails. The key challenge for us is maintaining our calm, collective approach to all of our events and keeping our clients happy and at ease. What do you find to be the most rewarding part of your work? We pride ourselves on having our events run perfectly, with no major issues. The most rewarding part of this work is the positive feedback from our clients, especially from building occupants or campus partners. Knowing that we’ve built a reputation on campus for running successful events at the Discovery Building and providing world-class technology support, is priceless. It’s great for both the Discovery Building and for our team.